This part of my website is now archived. This section of my website includes articles and reports on issues relating to industrial relations, trade unions and social partnership, in the context of a globalising world where the nature of work and employment is subject to change. It includes the texts of a number of reports written for, among others, the International Labour Organization (ILO) and UNI Global Union (UNI), as well as a selection of relevant articles from my journalism. Sectoral study on decent work in global supply chains: food and apparel. Written for the ILO, as part of a series of background studies in advance of the 2016 International Labour Conference debate on global supply chains. Employment Relationships in the Media Industry. Written for the ILO, and published 2014. A World on the Phone: experiences of call centre workers around the globe. A report for UNI Global Union, for call centre action month 2009. Industrial relations and social dialogue in the Web 2.0 world. 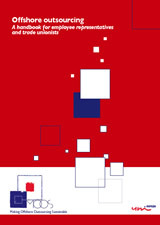 This report, written (2008) for a trade union audience, explores the implications for unions of participative internet applications such as Facebook, Second Life, Flickr and Twitter. Also available in French, German and Spanish language versions. The Thirty-Minute Guide to Private Equity. Written in 2008 for a trade union audience. Available in English, Russian, French, Spanish and German. You're being followed: electronic monitoring and surveillance in the workplace. (Written for UNI) This report is available in English, German, French, Spanish and Swedish. Published 2006. Opening the doors wide to the self-employed. How trade unions are recruiting and organising self-employed workers as members. Also available in French and German language versions. Written late 2005 for UNI. Also relevant to the relationship between self-employed workers and employees is my Freelance Ready Reckoner 2011-12, produced primarily for UK freelance journalists. It identifies day rates for UK freelances equivalent to annual salary levels for employees. The Global Mobility Revolution This report, written late 2003 for UNI, proposes a policy and an approach for trade unions internationally facing up to the issues of 'offshoring' and the remote migration of work. PDF format. Also available in French, German, Spanish and Swedish versions. Another more recent report for UNI, The use of migrant professional workers in IT, was written in December 2007. Also in French and German. On the same theme, I have edited Offshore Outsourcing, a practical guide for trade unionists and employee representatives dealing with the complexity of offshore outsourcing (2006). This handbook, written by Tom De Bruyn and Monique Ramioul, is also available in French, German, Swedish, Danish and Dutch. Global Concentration in the Media (2003, for UNI). This study suggests that concentration of media ownershp is an issue of concern both for unions and for wider society. Negotiating the New Economy: the Effect of ICT on Industrial Relations This extended essay explores the relevance - or otherwise - of industrial relations in a post-industrial information-based economy. It was contributed as a background paper to the ILOs World Employment Report 2001. It is available for downloading in sections, or - in unvarnished form - as a PDF. Employability in the Telecoms sector. This explores, among other things, initiatives by employers and unions in the area of training and lifelong learning. The report, for the ILO, dates from 2001.
International Trade Union Activity and work of Works Councils on the internet An assessment of trade union usage of the internet (published Jan 2004), this report was commissioned by the UK Communications Workers Union for the European project int.unity. Also available in German. Managing Change: how trade unions in Europe are helping the employability of professional and managerial staff (revised edition, late 2004). This report includes some examples of interesting new approaches by trade unions in the fields of organising, membership and training provision. The report (written for UNI) is also available in French and Spanish. An earlier (2002) version of this report is also still available, in English, French and German. Organising in Call Centres. This report is also available in French, German and Spanish language versions. It was written for UNI in 2000. Universal Development of the Post. Another report for UNI, this is a background report on developments globally in the postal sector, Versions are also available in French, German, Spanish and Swedish. Teleworking and Trade Union Strategy.This report is now primarily of historical interest, as the first document to explore union responses to the developing trend of teleworking. This report was written in 1996 for FIET, now part of UNI. Available in German: Gewerkschaften und Telearbeit. Tackling the Skills Gap: the Shortage of IT specialists in Europe (2000) is also available in French, German and Swedish language versions. This report was produced for UNI-Europa. 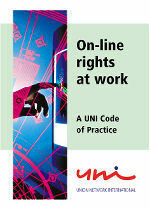 I have worked closely with UNI on the development of their On-line rights at work campaign. The code of practice, launched in 2001, can be accessed here in English, German, French, Spanish and Swedish language versions. I am the author of the book Information and Communication technologies in Europe: the trade union perspective (published 2002). More information about this book, including ordering details, can be found here. Organising on the home front - domestic workers (ILO) Also in French and Spanish. Note that other reports of mine as well as Powerpoint presentations I have made at conferences may also be available, on request by email.